A French version of this article can be found here. Optimism is in the air for the infamous green herb. Despite the fact that most policies regarding cannabis remain repressive, the trend is positive. In the U.S. – who started under Nixon, then Reagan the contested War on Drugs – the citizens of the States of Colorado, Washington, Oregon, Alaska and D.C. voted for a complete legalization of marijuana consumption. Moreover, 38 States out of 51, representing 76% of the U.S. population, currently have at least one sort of soft policy towards cannabis – medical authorization, decriminalization or legalization1. This evolution is recent: ten States regularized the consumption of medical cannabis in the five last years2. In the OECD, the medical use of cannabis is authorized in many European countries (Germany, Austria, Spain, Finland, Italy, Portugal), Canada, and Israël, while the Netherlands completely legalized weed already a long time ago. 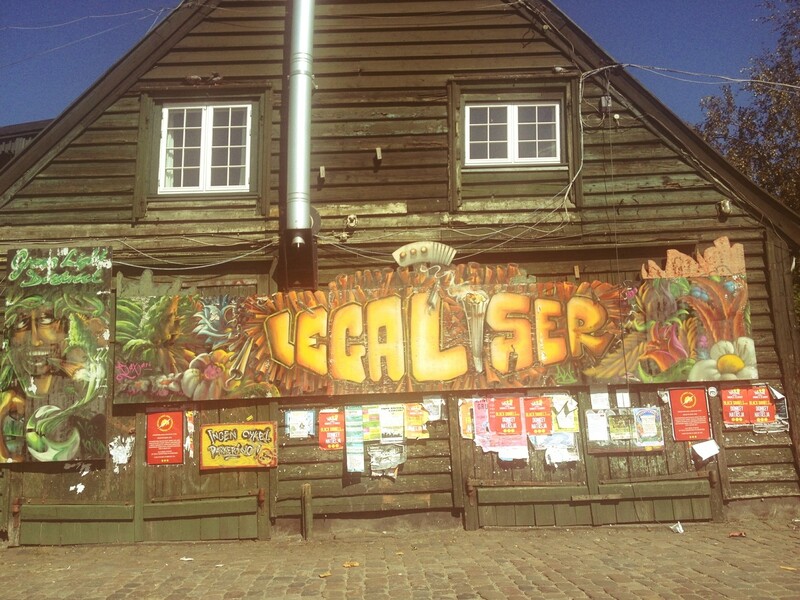 Finally, Uruguay is leading the way among developing countries, being the first one to not only legalize consumption but also nationalize its production by the State3. This trend perhaps isn’t surprising, and is only the result of the slow realization of how much of a failure repressive policies are. Far from decreasing the simultaneous rise of marijuana demand and supply, repressive policies have proved costly, financially and socially speaking. This article simply ought to substantiate this statement in figures and numbers. A U.N. report recently estimated the total number of cannabis users (at least one usage a year) at 180 million, making it one of the most used psychoactive substance in the world.4 Importantly, this number has only been increasing over time. In the U.S., whose inhabitants are the largest consumers per capita5, the trend is stable among young people, despite the inflow of money engaged into repression6. In the European Union, the consumption among young people (15-34 years old) has risen steadily in the past twenty years7. 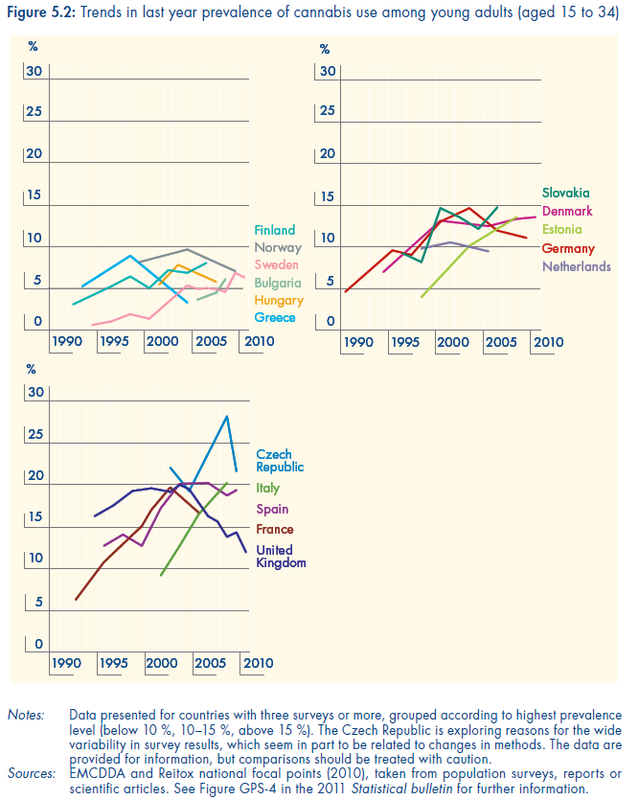 Interestingly, in the Netherlands – where cannabis consumption is legal – cannabis use has not risen faster than the European trend (see the graphs that follow), and the absolute level of usage is in line with the European average, making it much lower than in the U.S. or France8. Since the cannabis consumed must come from somewhere, this means that production has also risen in the same period; a 2009 report by the RAND Corporation hence estimated that criminal networks control a market weighting between 40 and 120 billion euros annually9. 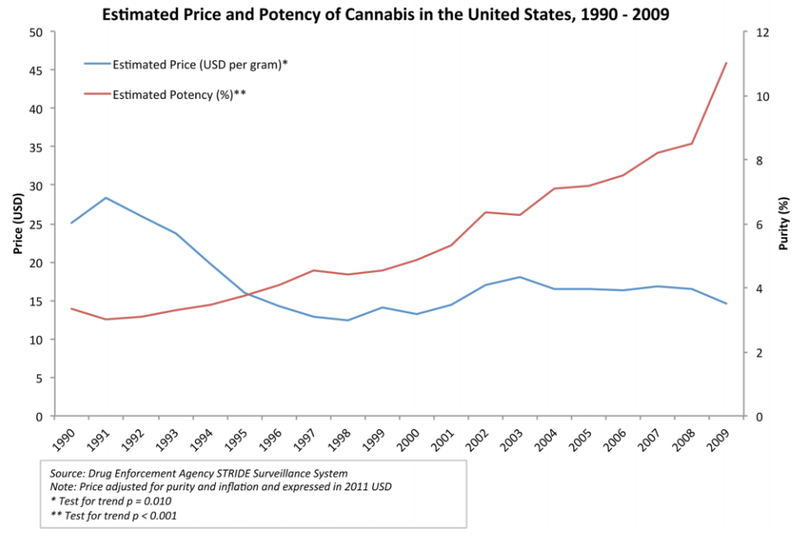 Meanwhile, the price of a gram of cannabis has decreased, as the next graph shows. Yet, cannabis seizures have remained stable, or if anything decreased in the last ten years. Certainly, this is explained by a reorientation towards more dangerous drugs, but nevertheless, it shows that repressive policies have been unable to control supply. This is even clearer when looking at quality: purity of seized cannabis (resin and herbs) has increased10, as has its THC content, causing public health concerns. Needless to say, this isn’t exactly the success proponents of repressive policies would have hoped for. 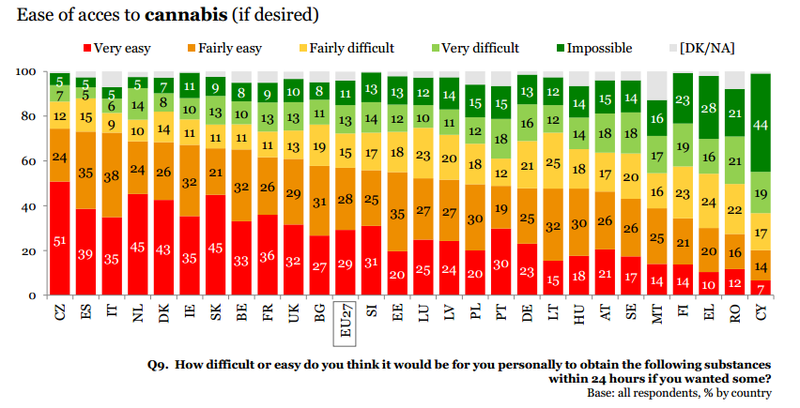 Worse still, more than half of young Europeans (57%) declared in a 2011 survey that they could have access “Very easily” or “Fairly easily” to cannabis in the next 24 hours if they desired some – a figure that was even higher in 201411. This number is, intuitively, highest in countries with high consumption or merchandise transit. Importantly, it suggests that authorities have either give-up or lost control of the situation; this is especially worrisome as young people are likely to be the most at danger with cannabis (as my next article on the topic will demonstrate). Finally, in a study recently conducted in Switzerland – a fairly representative country, as it has both a repressive legislation and a large consumer base –, cannabis users were asked the following question: for which reason would you stop your consumption? A majority of them give as a principal cause consequences on health or social relationship issues. In contrast, financial or legal reasons only represent respectively 2.1% and 1.2% of answers12, suggesting that consumers generally don’t have concerns regarding the illegality of their consumption. Repressive policies, it seems, haven’t managed to attain their objective in the last twenty years. Of course, a counterfactual world doesn’t exist, and one could imagine that those policies only slowed down a trend that would have been much worse. But whatever one’s opinion on this particular aspect, assessed against their own objectives at least, these policies have been a failure. The French case is representative: despite having one of the most repressive policy regarding cannabis in Europe, it has the highest consumption among the youth13. Explaining this failure in details isn’t the subject of this article, but a quick read from recent reports (see the end of this article) suggest that these policies are not expected to produce better results in the future – if anything, it would be the opposite. Two factors explain this prediction. First, the production has moved from abroad to local: in Europe, for example, herb imports from the Maghreb or the Middle-East have diminished relatively to local production14. Yet, large seizures are easier at the border compared to local, mobile production sites. Second, the production market has changed in structure: from being led by large, vertical criminal groups/gangs, it has become more horizontal, with many small, local entities having small monopolies at their place of activity. This decentralization of the market obviously makes repression harder15. Repression, evidently, comes at a cost. Most of the reports blaming the costs of the “War on Drugs” focus on drugs as a whole16, but studies specific to cannabis exist. Hence, 80% of total drug seizures in Europe continue to consist of cannabis17, suggesting how much police resources are being used by repressive policies against cannabis, often at the cost of fighting less well other criminal activities. Indeed, a recent British study, published in the serious Journal of Political Economy, evaluated the impact of a depenalization of small quantities of cannabis in the Lambeth neighborhood, London18. Result: every other type of crime diminished in a significant manner, a fact explained by the reallocation of police resources. 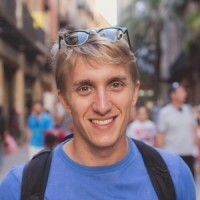 In France, Pierre Kopp, Professor of Economics at La Sorbonne, calculated in a 2003 study that the social costs of cannabis would approach a billion euro, with 55-60% of that figure being a direct consequence of repressive policies19. The social and legal consequences are even worse in the United States, where the “rule of three” – three minor offences, i.e. the illegal possession of marijuana, lead to a ten-year to life sentence – is partly responsible for the explosion of the incarcerated population: 50% of “criminals” in federal prisons are there because of drug-related convictions20. Moreover, this punitive approach causes important racial inequality, as was mentioned by both the New York Times and this report by an expert group from the London School of Economics21. To conclude, these policies are both ineffective and costly, fiscally and socially speaking. Why, then, do they continue to be pursued? One obvious reason could be that cannabis is fundamentally too dangerous to be legalized for human consumption. Of course, given that consumption rises despite repressive policies, this is not really convincing, as legalization doesn’t seem to raise consumption significantly (as in the Netherlands). Yet, a serious discussion of cannabis legalization requires a discussion of its public health impact, the topic of a follow-up article soon to be published. This article will demonstrate, however, that this debate is highly based on misconceptions, and an effective public health policy should actually promote the legalization of cannabis. These are some of my main resources. I took a special care in trying to document my facts as best as I could. 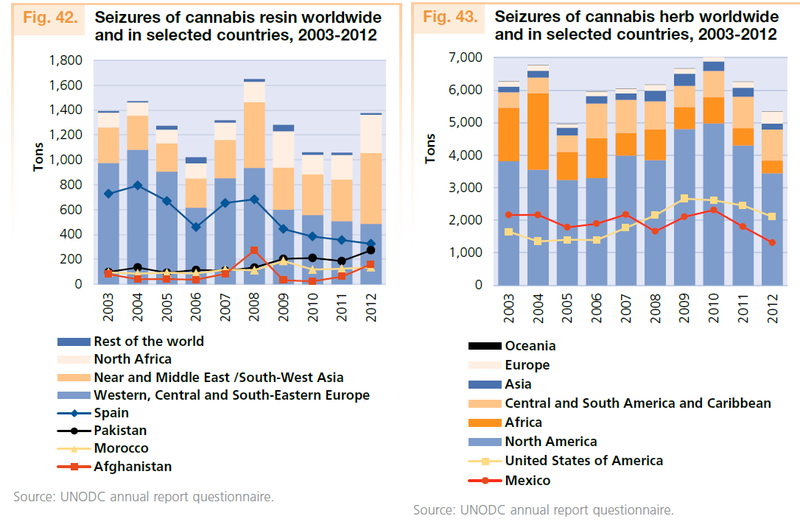 « World Drug Report », United Nations Office on Drugs and Crime, 2014. « Youth Attitudes on Drugs », European Commission, 2014. « Cannabis production and markets in Europe », European Monitoring Center for Drugs and Drug Addiction, 2012. « Rapport européen sur les drogues », Observatoire européen des drogues et toxicomanies, 2014. 14 « Cannabis production and markets in Europe », EMCDDA, 2012. 15 See this interview (in French) in the newspaper Première Ligne of Olivier Gueniat, a swiss policeman: http://www.premiereligne.ch/wp-content/uploads/2013/12/Journal_premiereligne22.pdf . See also EMCDDA (2012). 17 « Rapport Européen sur les Drogues », 2014.